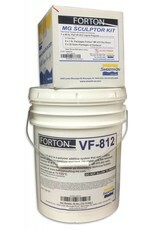 The Forton MG (MG stands for Modified Gypsum) Casting System is odorless, easy to use, non toxic and simple to patch. It is versatile for both solid and hollow castings. Because of these properties, casting is faster and takes less time to complete. The materials are water-soluble, so clean up is so much easier than with other casting systems. It has an extremely high strength to weight ratio so that hollow castings can be made much thinner. Repair, sanding and finishing are all easy on a casting made of Forton MG. It is white, but, it can be pigmented with water-based pigments to achieve a variety of effects, including cold cast metal and marble. By adding metal powders to the Forton MG, metal finishes can be produced that can even be patinated. With the addition of marble dust a cold cast marble can be created. Forton MG is very sensitive to mix-ratio and exact measurements must be maintained for best results. This requires the use of a gram scale to weigh the ingredients. When measuring, mixing or otherwise handling metal powders, dry resin, powdered hardener, cabosil or any other powders associated with the Forton MG mix, a high-quality (NIOSH-approved) dust mask must be worn. Fiberglass is usually added to the mix for strength. Both chopped fiberglass and woven fiberglass may be used. Care must be taken that the chopped fiberglass does no penetrate the face coat. Woven fiberglass though more expensive eliminates this hazard. The problem with most woven fiberglass is that it often does not lay flat creating air pockets that can weaken your casting. FGR-95 & Fiberglass are not included in the Sculptor Kit or with the Drum kits.